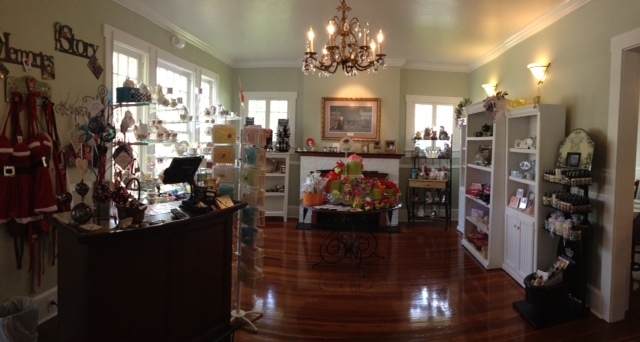 I would like to share with you an experience I had at the Wisteria Tea Room just over the bridge from our little city. About 3 years ago, a couple friends and I visited this tea room and it made me think of days gone by. I hope you don’t mind a re-visit to this nostalgic tea room. 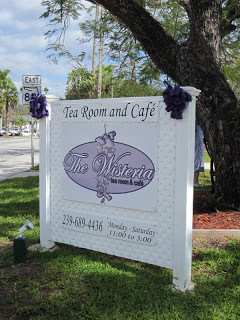 Today, two friends and I went to the Wisteria Tea Room, located in Fort Myers, Florida! Many of you who know me …know that I love my hot tea! Wow! 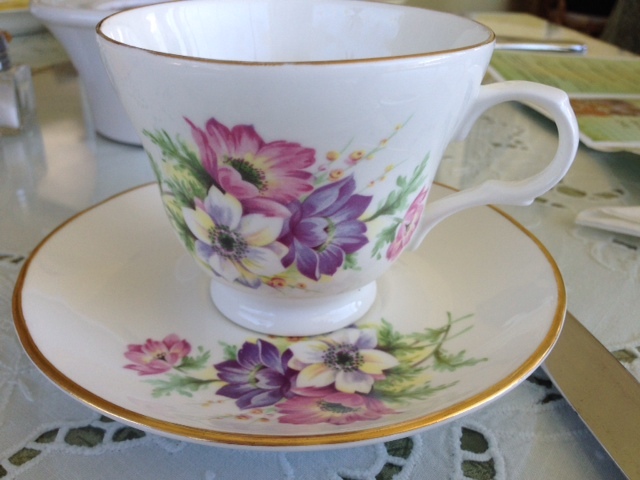 A special time set aside for tea….so when my friend Kathy suggested we go…I said I’m in!!! Neither of us, nor friend Sharon, had been to the Wisteria Tea Room and we were excited for this upcoming experience. I just love Tea Rooms! The outdoor sign was painted a delicate shade of lavender matching the color of wisteria! There were two arbors around the circa 1919 Florida Bungalow, draping with what I assume were Florida Wisteria vines (or Queen’s Wreath Petrea) and had they been blooming, they would have been magical with their elongated, lavender colored sweet-smelling florets. Today was like going back in time to a place where Southern ladies relaxed together on green roofed verandas: dressed in long, gauzy white dresses and big brimmed hats to ward off the warm summer sun. Perhaps one lady would have her dainty handkerchief tucked in a sash that cinched her tiny waist, with a bamboo fan in her hand which she occasionally would flutter for cooling. Or, perhaps…. a lady or two would tuck their hankies into their cleavage, like my grandmother used to do when warding off the small beads of perspiration that tend to gather in that delicate spot. And these ladies, these Southern genteel ladies would be sipping on exotic teas in bone china cups and nibbling on fresh scones served with Devonshire cream! That was then and this is now…..It was still an experience. My friends and I found this charming Tea Room to meet all expectations. 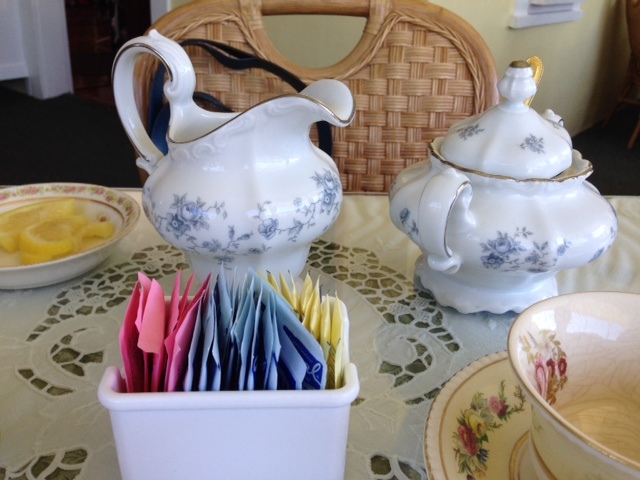 We were served specialty teas in our own lovely, little teapots with dainty floral cups and saucers. This was to be slowly enjoyed, nothing fast paced here. 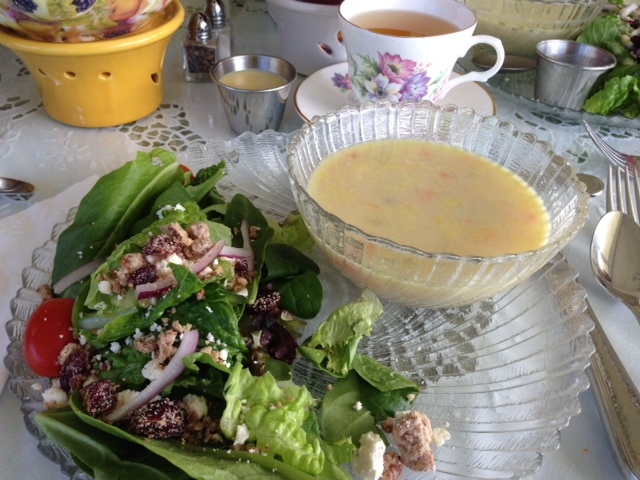 I had the most delicious wild rice chicken soup and the house salad which consisted of mixed greens, feta cheese, tomato, red onion, glazed walnuts and dried cranberries… served with a champagne vinaigrette dressing! Delish!! There are many choices from the menu including Miss Bobbie’s royal tea, served with choice of home-made soup du jour, fresh salads, and/or a tiered tray of delicious warm scones served with Devonshire cream. The menu boasts of savory tea sandwiches and fresh fruit treats, delectable tea desserts and of course the endless pot of tea. We were asked if we wanted to change tea choices over our drawn out lunch, which makes the event even more fulfilling with new tastes being acquired. A Tea Room should be enjoyed at a leisurely pace. If you go, be sure to leave time for browsing the little room stocked with everything tea and more! I highly recommend this enchanting experience which had me drifting back to a different time. I plan to return again and again. 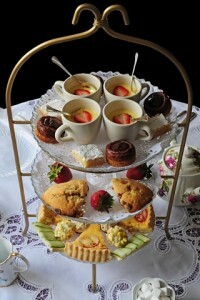 This was a wonderful experience much like a Tea Room I experienced in Smithville, MO with another dear friend. Yes, it takes me back to tea on a southern veranda in a day gone by. 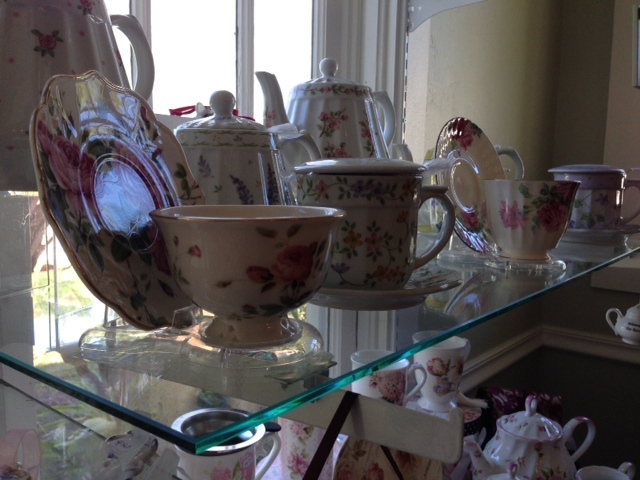 Have you visited a tea room lately? If you live in this area, I suggest you give this Wisteria Tea Room a visit or a revisit. « I Hope Someone Is Building An Ark….Cause We May Need One! Kari, I love tea rooms, too. Maybe, some day I’ll get to see this one, too. The door is always open and food in the fridge! Would love to see you (and John) my friend! Thank you for stopping by Pam, I have a dear friend who lives near London and we have discussed tea rooms and their wonderful fare many times, which is why I have my own cuppa on a daily basis. We need to treat ourselves and not just on special occasions, don’t ya think?